Earth Day was on Saturday and it came and went like any other day. Other than a few emails in my inbox from places like Eddie Bauer and Tea Forte- it didn't seem like there was much hullabaloo about it this year. I find this pretty sad. We know that most holidays have greater meaning than assigned by big box brand marketing. Advertisements go up months beforehand and gimmicky toys and candies are shelved everywhere you look. I find Earth Day to be one of the most under advertised holidays. It's a reminder to nurture the earth that we live in- and let's be real.... most of us need it. With our heads in our phones and tablets, we forget to take a look around. We tend to see with our camera phones and Snapchat more than with our eyes. Our experiences are more for social media than the enrichment of our souls. We miss the things that we're doing that are contributing negatively to the health of Earth. We order coffee daily, but we forget to bring our own cups and instead throw away paper cups, plastic lids, sleeves and straws everyday. We drive large cars and buy things we don't need from the Target dollar section (which eventually get thrown away). Our clothes are purchased frequently, made of cheap materials and we don't wear them long. We are constantly creating waste. I challenge you, and myself, to take a stand and start getting back to basics to care for our world. Gracie's shoot was on Earth Day. I have to admit that while I knew it was coming, I got caught up in life and didn't do much about it. In all honesty- I kind of even forgot that it was Earth Day until the ranger at Mount Rainier National Park handed me my park map and dismissed my pass on account of the holiday. While I thought about how nice it was that we didn't have to pay, I also found myself thinking it was a little backwards. Earth Day is the day that we SHOULD pay. It's the day that we should be visiting this wondrous mountain that's in eyesight from our backyards. We should be paying the $25 entry fee and supporting and encouraging the park to thrive. Most of us like a good bargain, but I hope that we can see the bigger picture and get back to giving back a little more. This post was quite a bit longer than I intended, but I think good conversation is good conversation. I love that we were able to be somewhere so amazing on Earth Day and that Gracie and her mom were able to experience it as well. While rainy off and on, the mountain always makes a spectacular background and Gracie is stunning! We struggled with doing "a walk" and laughed our heads off because it's so silly how something so easy can be the world's hardest task with a camera pointed your way. The candid's were perfect, and a wonderful example of how laughing off an awkward moment is always the best choice. 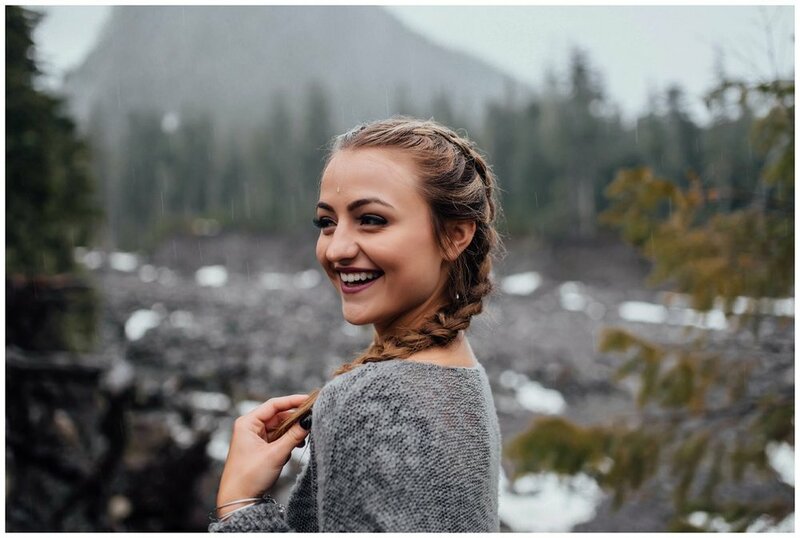 Thanks to Daniel Ross Salon in Bonney Lake, Gracie's braids were the perfect style for a mountain session with ever changing weather. 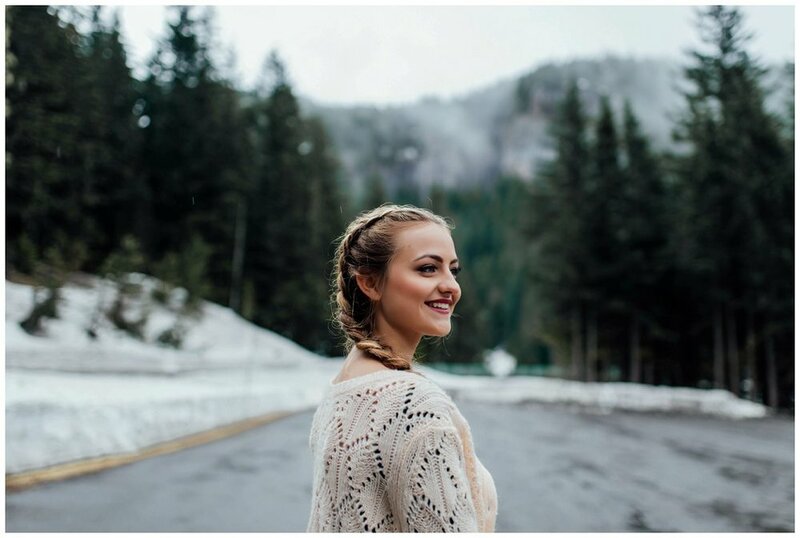 Scroll through to see Gracie's gorgeous Mount Rainier Shoot!